This plug-in is outdated. It hasn’t been updated since June 2016 (version 1.0.0.3) and will only function in RadioDJ up to version 1.8.2. This is mostly due to how the PluginInterface was implemented by Marius and because there’s no publicly available documentation or source code for potential plug-in developers. RadioDJ v2.0.0.x and newer is not supported and I don’t have any plans to resume development of plug-ins for RadioDJ. 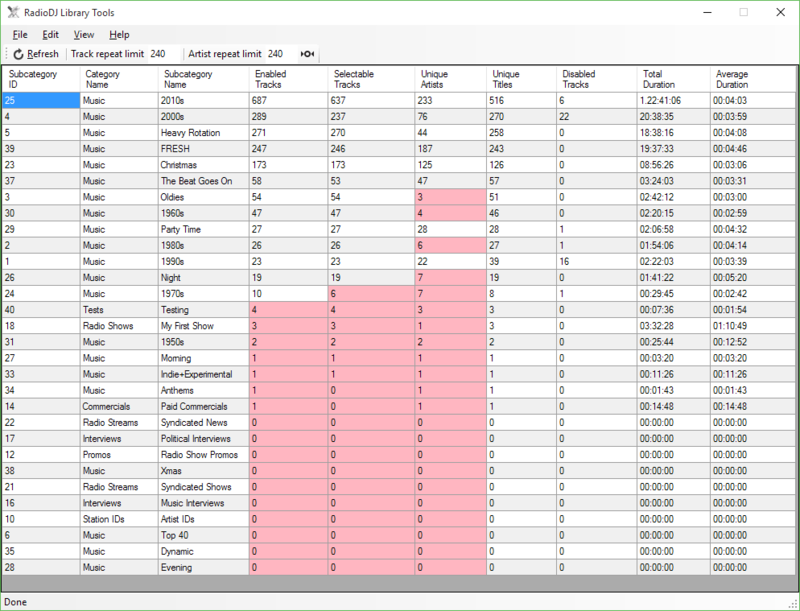 RadioDJ Library Tools plug-in provides an overview of available tracks in each category and is intended as a guide for building rotations and troubleshooting track quantity issues. The plug-in started as an SQL query for RadioDJ library overview. It all began on this RadioDJ forum thread. After initial release *life happened* and I completely neglected plug-in development. I realised that that original forum thread is the only place this plug-in was published. Many RadioDJ users may be completely oblivious to plug-in’s existence so I’m posting it here. ENHANCEMENT: Option to enter a minimum number of tracks. ENHANCEMENT: Added second tab to view data for genres. Grouping by subcategory is done using DataGridViewGrouper and that’s why rendering is slow. I may remove the grouping if there are enough complaints. I hope that some of you will find the plug-in useful.